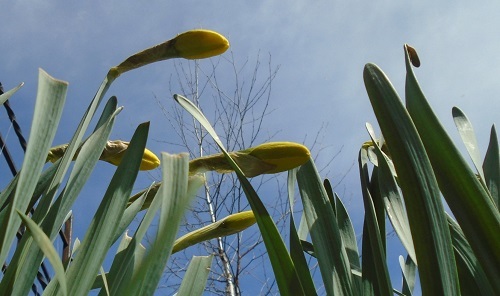 Spring has been on the longest pause in history raising this question: How long can a bud hold its bloom? 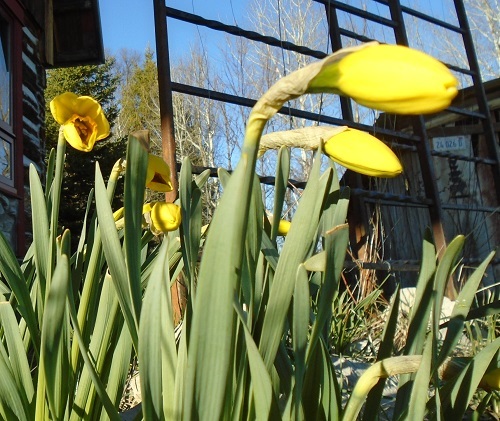 Daffodils on April 17, 18, 19, 20, 21, 22, 23, 24, 25. Every evening sounds of spring: peepers. Froggies gone a’courtin’. In the morning, birds. A flurry of song, an a cappella serenade, a peep a chirp a twee twee twee. A harmonic Let’s get to it! As if there is something to be got if one gets to it. Chickadees, juncos, sparrows, hawks, woodpeckers, flickers, a-rat-a-tat-tat, mergansers on the river, gulls overhead (a bit off course? 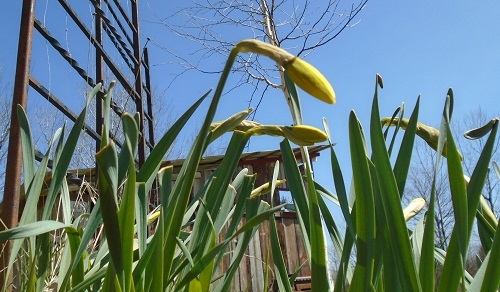 ), geese blowing horns, eagles, robins, and one day a pair of goldfinches, like lemon drops on wing. I stay mired in obituaries. Obituaries of time. Specifically obituaries of one Treloar or another, clipped from a local paper, perhaps the Argus, Times-Record, or Grant County Herald, folded then, sent through the mail to be unfolded, read, stuck in a drawer. Or was it a file? How were they kept, these obituaries from 1919, 1939, 1914, 1950? Perhaps in a drawer of my grandmother’s desk, the one that sat dark and heavy in a corner of her dining room, or maybe, first, it was my grandfather’s desk and he kept the obituaries until one day in 1950 his joined the others and all became my grandmother’s, until one day in the 1970s my mother took possession and put them in her desk. Now I have them, but not in a desk. In a filing cabinet. One rainy day I pull them out. Alongside comes a dead mouse. It gives me a turn. Now how did she get there? How long ago did she die? What is her story? But I must get on with it, so I toss her away thinking that rather than asking Why was this kept? the question might be Why was this not thrown away? I organize the obituaries under my father’s influence. He left an example: an obituary from 1980 affixed by rubber cement to a piece of plain 8½ by 11 paper. (Rubber cement was my father’s favorite adhesive, although at times he used mucilage.) Typed at the top of the page is the name and date of the newspaper. I rebel just a bit, do it somewhat differently. I do not have the names and dates of the newspapers, so at the top of each page I type the name of the deceased, date of birth, date of death, and the relationship to my grandfather, he being the one introducing Treloar blood. And through this process of carefully unfolding feeble yellowed paper that threatens to disintegrate with any errant touch, flattening and securing each to new white paper, seeing how crumbled pieces can be fit together, inhaling the fumes of the rubber cement and then reading and learning how one person suffered from facial neuralgia, another from attacks of quinsy (and “quinsy” I have to look up), and how one suffered his first heart attack at the funeral of the other, I feel the beginnings of maybe knowing this family. I notice the interplay of birth dates and dates of death; I see who was named for whom. From another file folder I take drafts of family trees my father constructed in black pen and blue pen and pencil, and these charts help it to come together in my mind, these people who are my mother’s father’s family. I knew none of them, of course, not even my grandfather, who died seven years before I was born, but it seems I have always known the vague story of the Treloars, the long history of their begattings and migrations, which need not be vague at all. There is an immense document—now online—that a Wyoming Treloar put together many years ago. I have a letter he sent to my mother in 1948 asking for information. He was in the early stages of his project, of constructing the “tree of Treloar,” and many years later when the project was done (done until the next babe was born, that is) and this tome became available, well, I was a kid, then a teen-ager, a young adult, I had no interest in any of it. It seemed fuddy-duddy and burdensome. The Past! But now, as the much more mature person that I am, I am fascinated. Thank you, Orson Lee Treloar, for all the work, for all you have given. The Treloar faction that eventually begat me left the parish of Wendron in Cornwall, England, in 1848. Millers and tin miners they seem to have been, fallen on hard times, feeling a need to cross the ocean to sustain themselves, to make their way. I find Wendron on a map, just north of Helston, and think someday I would like to go, visit the Lizard Peninsula, as long as it is nowhere near Midsomer, where all those murders happen. 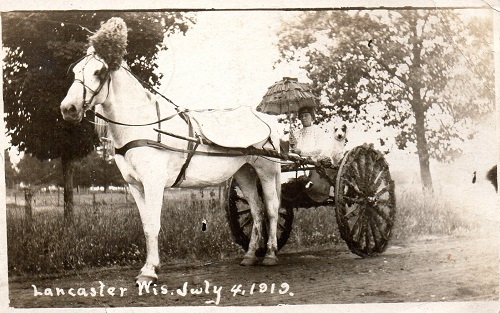 My great-great-grandfather and family settled in Lancaster, Wisconsin, became farmers. In 1904 my great-grandfather, then in his mid-forties, pushed his brood westward across the Mississippi, to Iowa, the good north-central farmland. Soon thereafter a son of Treloar met Daisy, the country schoolteacher, the one who came to Iowa via orphan train. I see “Daisy Morris” forever nestled there, in the tree of Treloar, page 46.
from Lancaster. This one is from Aunt Elfie. See the dog? Her name is Fuzzy. I realize that by affixing these obituaries to sheets of paper I am losing the backside of each, the B side, as it were, which is sometimes better than the A side, and, if nothing else, a scrap of context. 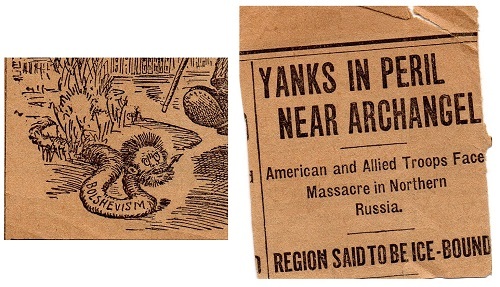 On the B side of my great-grandmother Abbie’s obit, from April 10, 1919, there is a piece of a political cartoon and part of a report on the North Russia Intervention. In order to call it that—the North Russia Intervention—I have to look it up. I first saw photos of Abbie, a Treloar by marriage, just two years ago when I met Tom, a third cousin, online as I was searching there for my grandmother Daisy’s grave after the actual search in the graveyard left me befuddled. Tom and I are related through Abbie (maiden name Gardner), and I can’t explain it any further except to say that Aunt Elfie (the one in the buggy with Fuzzy) is Tom’s great-grandmother and Abbie is my great-grandmother and Elfie and Abbie are sisters, so, voilá, Tom and I are third cousins. And Tom, by the way, is a professional genealogist, which I tend to forget. 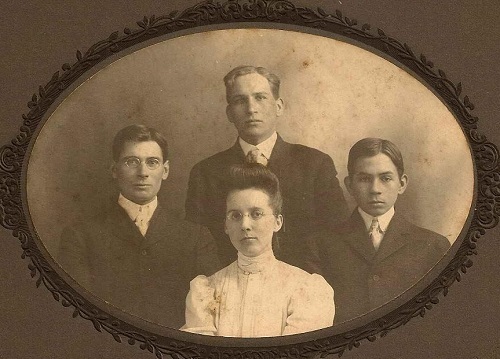 Mostly I think of him as a third cousin out there somewhere who has nicely sent to me, along with other items, this photo of my great-grandmother, her siblings and mother. Abbie stands left, Elfie right. Lovilla is the one staring straight at the camera. Was she rebellious or just hard of hearing? Tom also sent the only photo I have of Abbie’s daughter, Alice. The handsome fellow standing behind Alice is Homer, my grandfather. I have a few photos of him and his brothers; it is nice now to see Alice, too. 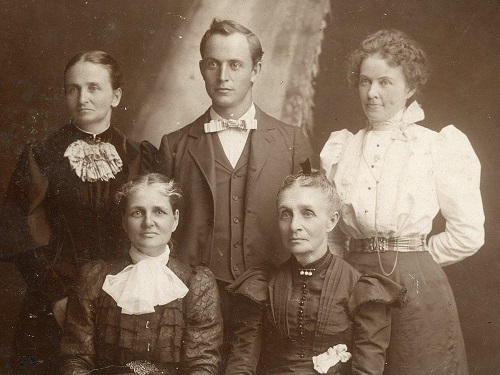 Ellsworth, Homer, Bert, and Alice Treloar. It seems when not chasing rabbits, I stay mired in the past. I can’t seem to help it. I think I am discovering something—but what? It unfolds so slowly, I think by necessity, like peeling the skin of an onion, taking off the flaky old layers to get to the sweet juicy food—but it’s not like that at all, is it. More like putting layers back, retrieving them, fishing them out of some dustbin to make something whole again, but maybe—after all—it is nothing. Maybe I am just passing time, waiting for something to bloom. Har har....Trezonas were from the Lands End area of Cornwall. Satterly was from Devon and the Harris family (Lon's paternal grandfather) were from St. Austell, Cornwall, which we were able to visit once. As for genealogy, when we went looking the parish priest said, "Oh the Harris family, the rich stone merchants. Definitely the wrong Harris family...Lon's grandfather was told to go to America at age 16 and earn his way in the mines, since there were too many children to feed! I hope you enjoy writing this as much as I enjoy reading it. It has become my Sunday morning fix! P.S. 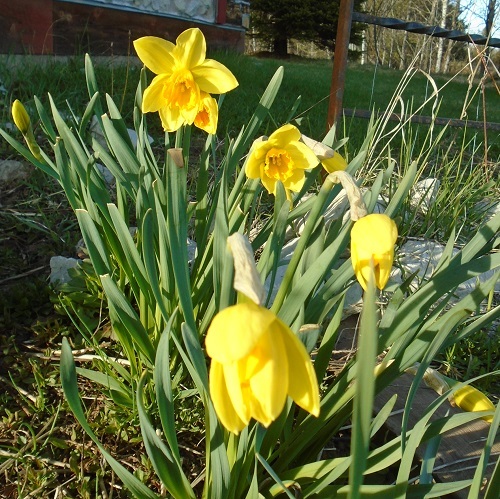 Your daffodils have bloomed way before mine. Only green shoots coming up here. Ah yes, this writing is my enjoyment. You know, of course, that I moved to this part of the U.P. for heat. Soon I will be complaining about it. I just love me some genealogy. Had no interest at all when I was younger either. Could have gotten so much interesting information from family who are now long gone if only I'd been into it earlier. ~ P P.S. You have gotten me totally hooked on the Wednesday jigsaw puzzles!